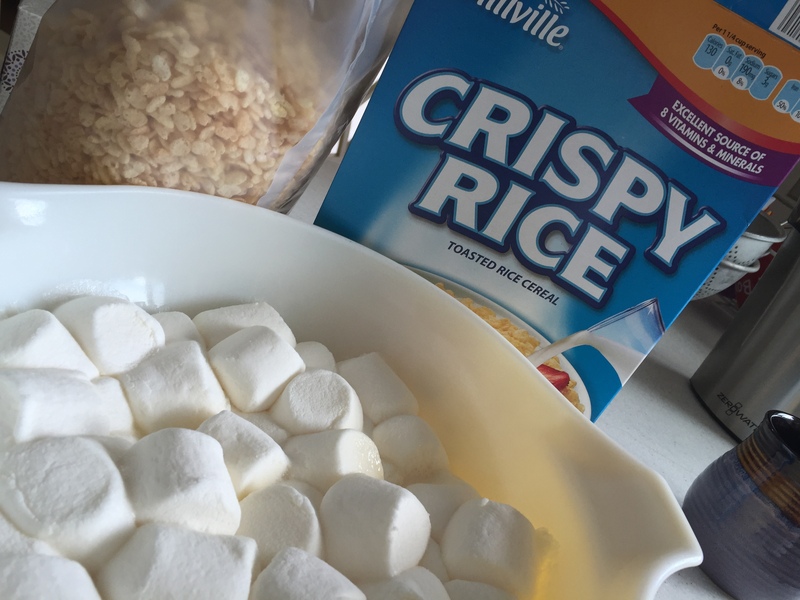 I was lamenting at a gluten-free event how I was sad Gluten-free Rice Krispies were no longer being sold in the USA. The person looked at me like I had been living under a rock. “ALDI’s Crispy Rice cereal is gluten-free” she said. I went to ALDI that day! At the time I did not shop at ALDI much. The last time I had been there there was not much of a selection for my family. The new gluten-free line of products is good, there is soy flour in the cookies which makes them a “No” for us. The Crispy Rice Cereal however was a “Yes”! So were the marshmallows! To make the treats I followed the directions on the marshmallow bag, and used Earth Balances Soy-free spread in place of butter. I also used a tricked learned from one of our favorite teachers. Heat the marshmallows and butter in a glass (or your favorite Pyrex) bowl in the microwave. I don’t use my microwave very often, but this is one of my reasons for loving them. There are no after pictures because we ate them so fast. Next time I will melt some dairy-free chocolate chips on top. Yum.